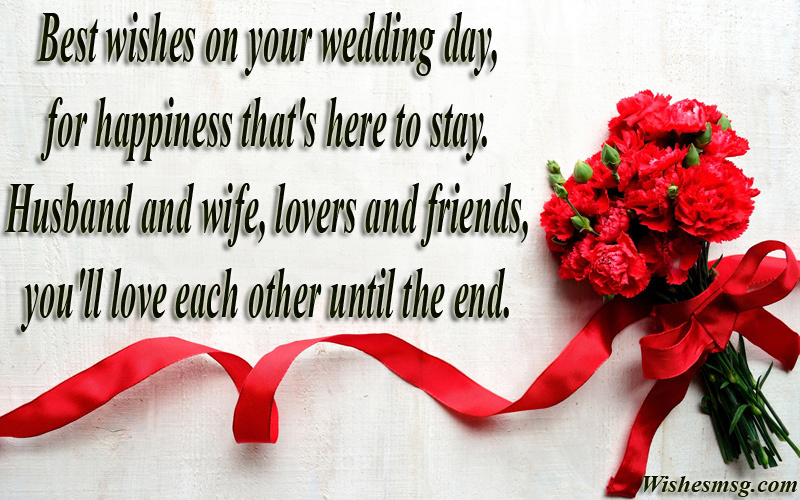 Wedding Wishes and Messages : Sometimes our words fall short to congratulate the newlyweds and wish them a happy married life. Most often we simply can’t find how to express our well-wishes for the just married couple and choose to general or old-fashioned words which could probably don’t feel good all the time. So that, here we gather some best wedding wishes and wedding congratulations messages which are appropriate. Read these wedding wishes to get the right idea and make your wedding congratulations messages more appealing to the bride and groom. 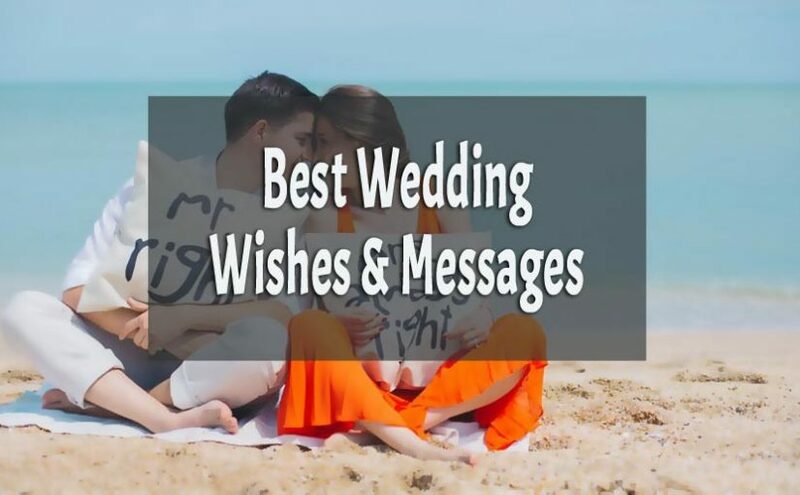 Get a unique way to send wedding messages to the just married couple and wishing a happy married life also you may send “Happy Honeymoon Wishes“. You may write in a card and note or share in Facebook, Whatsapp, Instagram or any other way you like! May the love that joins you together only become stronger in the coming years of your life. May you have a prosperous life ahead! It’s a new life and new journey that you both have vowed to continue together. ay God bless you and guide you in the right way! Two beautiful hearts joining together with a promise of never letting go of each other. Take my warm wishes of lifetime happiness, joy and prosperity for you! May the delight in your eyes today stay with you through the thick and thins of married life. Many good wishes for your new life! I’m so happy that you finally have found the person you were dreaming for. May your marriage be everlasting and ever-exciting! Congratulations to both of you! You’ll make a great family for each other and great parents for your babies. My good wishes and prayers are always with you! You two have found the perfect partner for each other. Never let each other feel alone ever again. Enjoy an exciting post-marriage life! You are going to make a lot of memories with each other. Be it good or bad, romantic or dull, never lose hope on each other! True happiness can only be found in the arms of the one you love. God bless you on this special day and for the rest of your life together! You are the sweetest couple I have ever seen! You two deserve the best things in the world. Keep happy with each other. Happy wedding! The relation of husband-wife is the most beautiful relationship of the world. It’s the relation by which two different people turn into one entity for the lifetime. Best wishes to you too. Happy wedding! It takes a lot of courage for a man who goes in a war knowing that he will never win. All the best wishes for your marriage! Marriages are wonderful except to those who have already married. God bless you both for the new life you are going to start together! No one wants to go to prison but everyone wants to get married. This world is so full of irony. Congratulations on your marriage by the way! You were mad for each other before today. From now on you will be mad at each other. That’s the magic of the wedding. Have a good time! You must have already started to think that it’s a mistake. But its too late my friend. You’re now officially a prisoner! Congratulations! May God always guide you to lead a married life full of love, compassion and purity. May you both find true happiness in the prayers! God has brought your hearts together for creating a lovely, religious and loyal bloodline. May his blessings be always with you! May God help you to overcome all the ups and downs of a post-marriage life. May he gift you a divine soul in form of a newborn! God must have had a list of amazing plans for you when he decided to bring your hearts closer to each other. Let’s thank him today for everything! God has made a perfect partner for each other in this world. Yours seem to be the most perfect pair of all. God bless you! Marriage is the gift of Almighty. I hope you two will find peace and happiness in life. May God bless you. Happy wedding, my dear! Wishing you two a very happy and blessed married life! My heartfelt congratulations go to both of you for finding each other out of billions of people in this world. You seem too perfect for each other! Not often you see a pair so beautiful and amazing that it seems like they are literally made for each other. Congratulations! May your marriage be happy and everlasting! When you make love the first priority, you always end up with a wonderful result. Your marriage is one among those wonderful consequences! Your marriage is like watching a tv show. Both of you look so happy and glowing. Congratulations dear. May the delight of today remains forever! Thanks for making us all happy today. You really have a very good taste in choosing your partner for life. Congratulations to both you! The desire of you two finally comes into true. Let your marriage be stable until the last day of your life. Heartily Congratulations on your wedding! Congratulations on the happy day! It’s your wedding ceremony! I wish Almighty always keep you in his blessings. And wishing that you will spend a lot of happy years together! Marriage is the connection of two souls. The Conjunction of two hearts only acquires by true love. My dear, wishing you a cute married life! Dear newlyweds! I am so much glad because I get to enjoy your wedding! How sweet pair you are! All the best wishes are for you two. Keep smiling! My dear, you just entered into the amazing stage of life. The life of happiness has begun! Happy wedding! 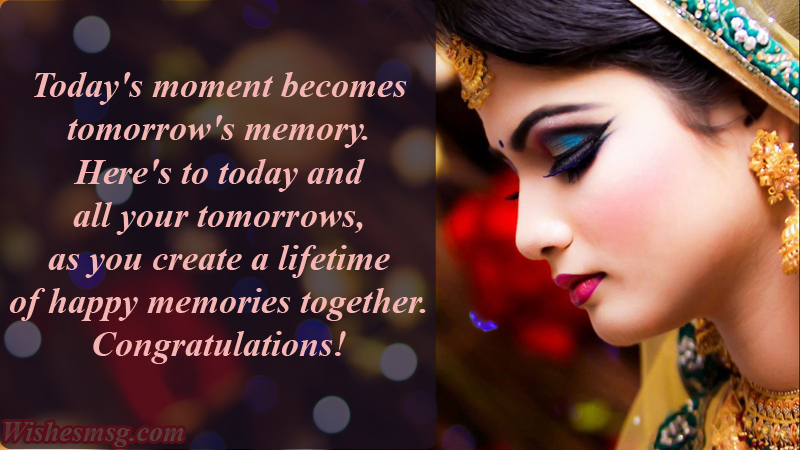 May your life together be filled with a lot of unforgettable moments! Be happy and keep happy! It’s your journey to the new road of life. May God bless you. I wish, you together will find all the colors of happiness of life. The endless peace and joys are waiting for you two. Happy wedding! Marriage is not only about the craziness and joys. It’s about the liabilities and responsibilities. So, make yourself prepare to protect your family peace. Wishing you never-ending love and happiness! Happy Conjugal life! Congratulations on your starting of a new chapter with the person you love. It’s wonderful to see the joy in the eyes. Wish you all the best! You deserve no less than a beautiful married life and a pair of beautiful babies. Have a good time at the wedding. Take my love for both of you! You are the most romantic pair I have ever known. Congratulations on your wedding. May you have the sweetest married life ever! You have always been my best friend in life. I have full confidence that you’ll make a good family with your beautiful wife. Congratulations! It makes me just as much happy as you today. May the love and affection only grow between you two in the coming days of your life! Oh, my dear! It’s your wedding ceremony! You have no idea how much happy I am now! The wedding of you two just makes me dance in my mind. I am wishing the best for your Wedding day! You two are the lovebirds, the love and affection between your pair make me so happy. Take the best care of each other. You two deserve the best wishes! Happy Wedding Day! Marriage is the holy relation. You two just entered into the new stage of life. I hope you will find all happiness and joys of life. Best wishes to you. Happy wedding day! We hope you have enjoyed this wedding wishes messages and happy married life wishes to congratulate a newlywed couple which is too cute to bring a smile and feels them so special. 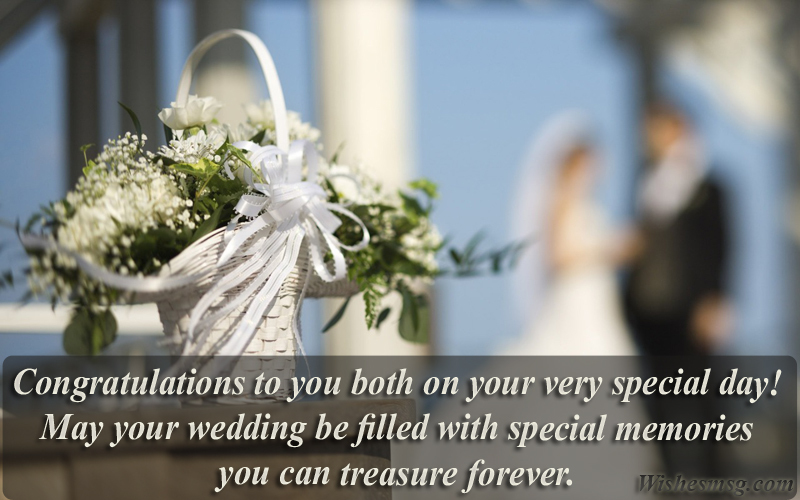 Send inspiring and encouraging marriage wishes to your friend couples on their big day who decided to tie the knot.